The world's scariest wedding dress train. The train weighs 220 pounds and clocks in at 200.8 meters long, or about 695 feet. 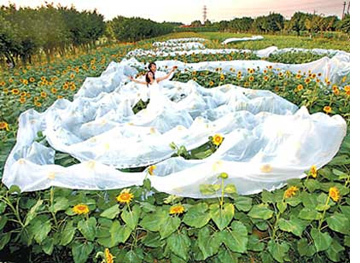 For this wedding photograph, taken at Guangzhou Sunflower Garden, workers spent almost five hours arranging the fabric, according to Ananova. Apparently, the original plan was for the train to run 2,008 meters long in honor of the coming Beijing Olympic Games, but that would have been just too hard, too much. So Ken scaled down the extravagance to just 200.8 meters. It took a factory three months to produce. Oddly, the story doesn't even give the betrained bride's first name. Ken's comment on the meaning of the train can read either sweet or a little creepy: "I hope the long train will bind us together forever," he said. In any case, let's hope their long, happy marriage makes this train seem short by comparison.